Because I am not made of stone. I am a man, and all men have their weaknesses. Anyway, this week’s climactic Octoberween extravaganza brings you not just a triple-feature, but one of tripled excellence. It’s not just an Edgar Allan Poe triple-feature, not just a Roger Corman triple-feature, not just a Vincent Price triple-feature, but a triple-feature of all three at once three times over! This is also my third Octoberween article of the month and my third Octoberween at Rooster Illusion, so… three’s the number, I guess. I think I’ve made myself clear. 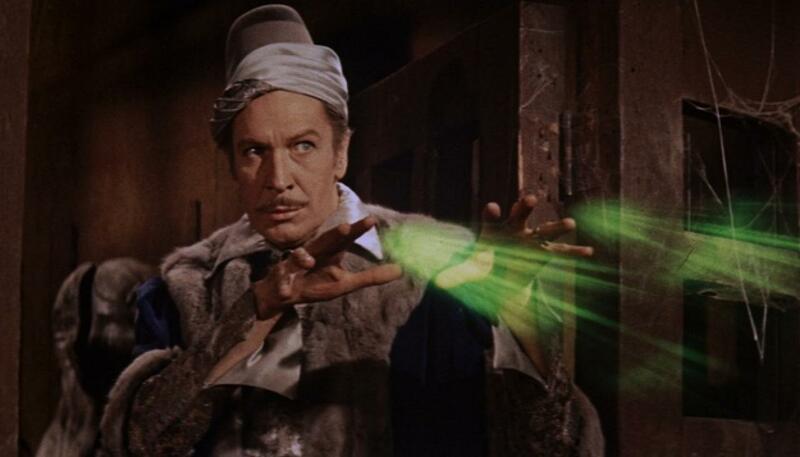 Following the success of his 1960 House of Usher, an adaptation of Edgar Allan Poe’s “The Fall of the—,” Roger Corman made a bunch of other Poe movies, most of which starred Vincent Price. Some of them are great, like his 1964 Masque of the Red Death, an adaptation of that story and of Poe’s “Hop-Frog.” Both House of Usher and Masque of the Red Death take some liberties and extrapolations in order to make 90-minute films out of short stories, but this success quickly caused Alta Vista to transform screenplays into Poe adaptations; such was the case with The Haunted Palace (1963), which bears closer resemblance to a spooky H.P. Lovecraft story than to its namesake POEm. This practice produced a few really good movies, and some genuinely odd ones. Let’s start with a good one. 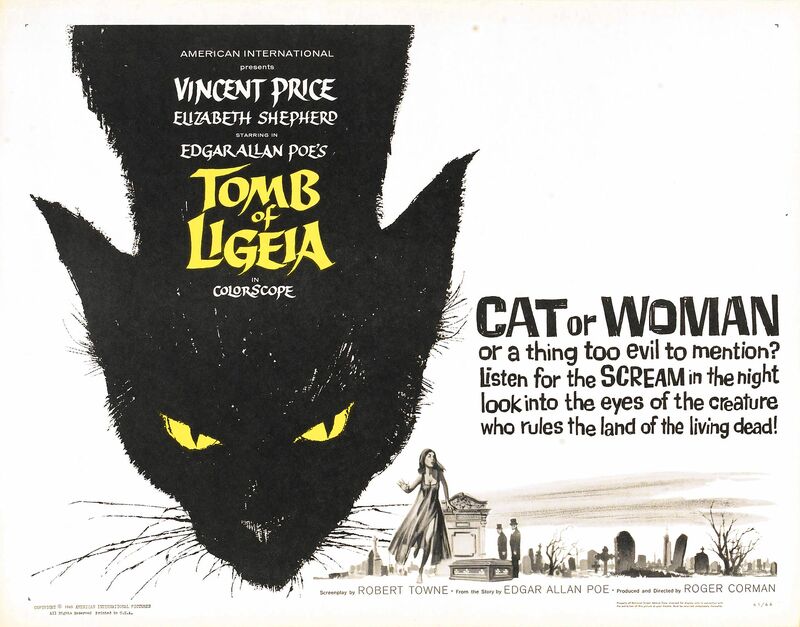 I suppose it’d be pretty difficult to screw up an adaptation of Poe’s “Ligeia.” It’s one of Poe’s most brilliant meditations on death and the haunting trauma of loss, right up there with “The Raven” and “The Conqueror Worm.” In order to pad it out a tad, Corman employs the same method he used for Masque, and combines “Ligeia” with elements from “The Black Cat.” It’s not a perfect mix, but his use of the latter is mainly for aesthetics (although the aesthetics here are mostly dominated by the dilapidated medieval abbey previously inhabited by a collector of ancient Egyptian artifacts). 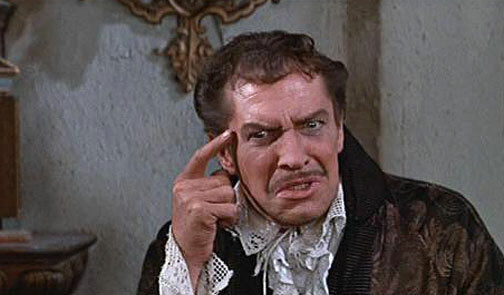 True to form, though, Vincent Price steals the show. Rather than playing the creepy Satanic torturer of Masque or… many of his other films, he here embodies the quintessential Poe protagonist… Poetagonist, I guess: broken, haunted, and spiraling into a subtle, grief-stricken madness. Dig it. Actually, I guess it is, in the sense that Vincent Price’s character does start out as a decent, if somewhat wounded man who slowly spirals into madness. Whereas his spiral in The Tomb of Ligeia remains consistently tragic, here that spiral culminates in confusing his identity with that of Chief Torturer of the Spanish Inquisition (spoiler alert). This film sports a brilliantly edited and considerably famous final scene, in which Price goes overboard and starts strapping people to pendulums and other torture devices, etc. Poe’s short story, “The Pit and the Pendulum,” more than perhaps anything else he ever wrote, offers a definitive look at the innate terror and insecurity of total darkness. Obviously, that’s not something you can depict in a film, because movies are, I’m told, somewhat dependent upon light. As such, Corman’s movie has little to do with Poe’s story until the final scene, but if you’re happy to sit through an average Gothic melodrama for an hour until then, it’s worth the wait. Price outshines an uncomfortably dry supporting cast, rather than just indulging in his normal level of outshining. Ah, we’ve all been there. That explains some of what happens, but doesn’t explain how they wound up picking Poe’s most recognizable and otherwise seminal piece of horror writing. Nobody thought to pick something that nobody had ever read and gone with that? I guess the problem here is the undeniable fact that none of Poe’s works could be translated into a comedy about dueling wizards. Not really how I remember this poem. But enough of that. Vincent Price and the wonderful Boris Karloff play the two dueling wizards in The Raven, with a supporting cast including Peter Lorre and a very young and unrecognizably goofy Jack Nicholson. Once you can get past the immediate confusion of, “What the hell am I looking at here?” The Raven is quite a good bit of fun. The actual wizard duel itself is a lot of fun. Price and Karloff clearly enjoyed emoting wildly and striking intense poses while the VFX team animated (I assume live with the take) thunderbolts, fire, sparks, and other appropriately wizardly phenomena.